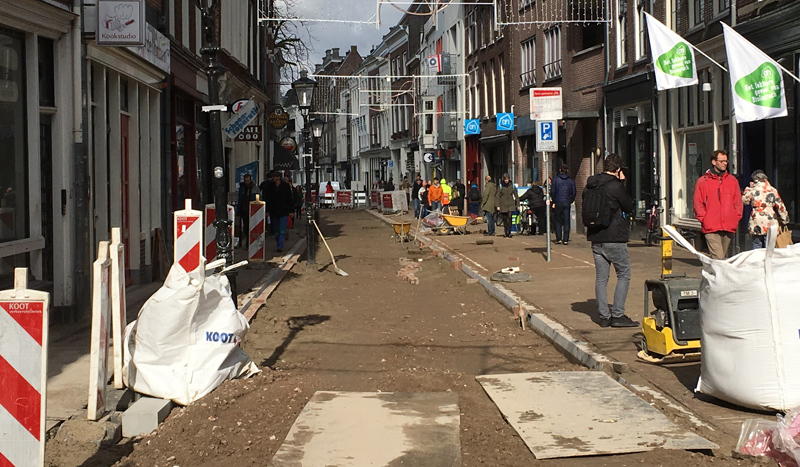 Yet another street in the Utrecht city centre has been reconstructed. The narrow Twijnstraat, already a shopping street in the 13th century, was designed for motor traffic. It has been transformed into a street for walking and cycling. 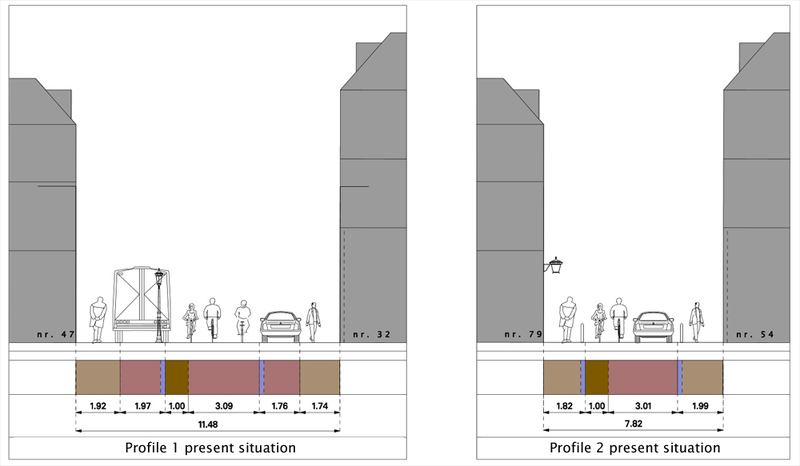 Almost all customers, 96%, arrive on foot or by bike, but the street was tailored for the 4% arriving by car. That was ridiculous and it has been corrected. Twijnstraat as the city council likes to see it. Full of life! People on foot walk where they please and many ride their bicycles. The bicycles on the right are parked on their kick stands. When they are gone again the space can be used for walking. Over a thousand years ago Twijnstraat started its life as a road on the shore of the river Rhine. Now it is a flourishing shopping street. Very narrow (ranging from 6 to 13 metres in width) and about 200 metres long. There are houses and stores on each side of the street and on the former river side, now the Oudegracht (Old Canal), there are even two rows of buildings. The extra row of houses on the water front can only be reached on foot, by 4 narrow alley ways. The slopes of these alleys towards the water remind us that this truly was a river shore. When Utrecht was granted city rights in the year 1122, the city wall was planned to include the city centre (around Dom square), but also this flourishing trade centre around Twijnstraat. It is the reason that Utrecht has a rectangular shape, rather than the more circular shape that was common for cities at the time. The Utrecht mediaeval city centre has a maze of smaller streets and houses. From the central Dom tower of the cathedral, every part of the city centre can be reached within 10 minutes, on foot! Despite this city scape the people in the 1950s and 60s decided that the centre had to be opened up for motor traffic. That meant that people walking and cycling lost ever more space to the private car. This tendency had slowly been reversed a long time ago, but just a few years ago, the council officially reversed that decision. Utrecht has now chosen to make the public space in the city centre first and foremost the domain of pedestrians and cycling. It needs to become a pleasant place, where it is nice to stay. This increases the value of that space and the economic vitality. Slowly but steadily the city centre is handed back to people, by subsequent street transformations. (Three earlier examples.) Motor traffic can still reach most destinations in this part of the city, but drivers must behave as guests in an environment that was not designed for their needs. The before situation (picture Utrecht municipality). The after situation (picture Utrecht municipality). The Twijnstraat had a 4-metre-wide traffic lane. Only to be used by motor traffic in one direction. For cycling there was a counter cycle lane. This counter cycle lane made cycling possible in both directions. Drainage grates were located in the middle of the traffic lane, posing a danger, especially to cycling. The street had 15 parking bays for private cars and 1 for people with a disability. No less than 97 metres (almost half the length of the street) was designated as loading zones. About 60 metres of the street was used for bicycle parking. The sidewalks ranged in width from just 1 to 2 metres. These narrow sidewalks were extremely cluttered with posts (lamp posts and a lot of traffic sign posts), bollards and a lot of “stuff” the shop keepers put outside their shops. These many posts were also used to park bicycles against. Twijnstraat during the reconstruction works in the spring of 2016. The street was only accessible on foot. In close collaboration with the entrepreneurs and the residents of the street, the city described a desired future situation. 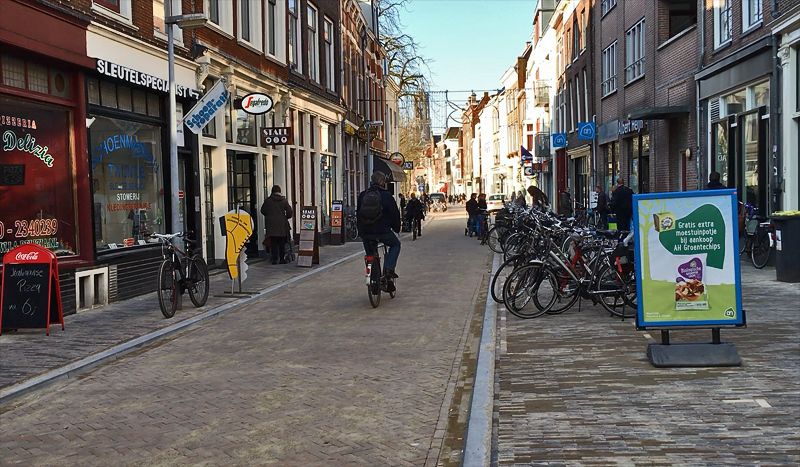 It would like the Twijnstraat to be an attractive city street in the centre of Utrecht, where people stroll the wider sidewalks. The number of objects on the sidewalk, that shop owners put there, will be drastically reduced. By hanging the lamps from the facades and by reducing the number of signs, the number of posts will also be drastically reduced. Both measures are taken to increase the space for walking. 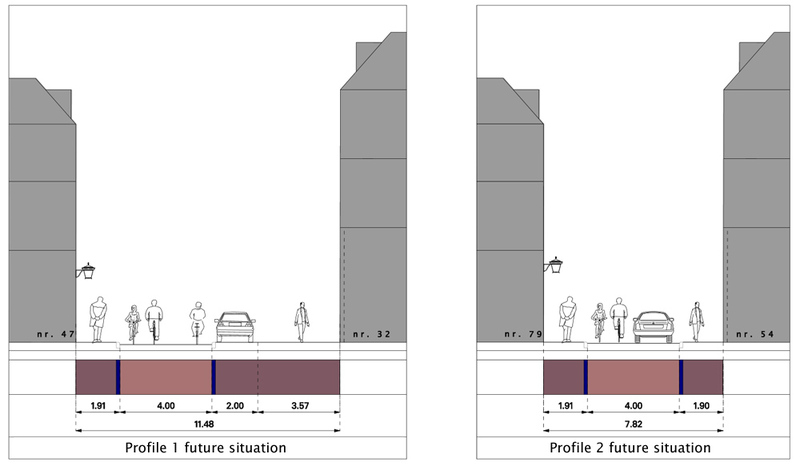 The many people cycling will share the narrower traffic lane with fewer private cars as well as delivery vehicles. Parking will mostly be relocated to other areas. This goes for motor vehicles and bicycles. 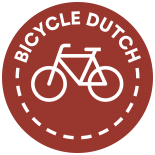 Short term bicycle parking will take place in designated squares in the street itself. (Especially for shoppers.) Residents will park their bicycles in a neighbourhood bicycle parking facility. Other longer term bicycle parking will be done in racks in the side street. To improve safety for cycling, the drainage grates will be placed in the gutter. The de-cluttering of the sidewalks only worked to a certain degree. All the “official clutter” is gone (no more lamp posts or traffic signs), but the shop keepers do put out their signs and other material to draw attention to their shops. In this picture there are still two temporary lamp posts. (One of which is promptly used to park a bike against.) But these have all gone in the end-situation, replaced by lights fixed on the walls of the buildings. Not everything of the desired end situation has been achieved yet. Some of the wishes are for the longer term and will only become a reality when the whole area is reconstructed. But a lot has been done in the reconstruction in the spring of 2016. The shop owners and residents celebrated the re-opening with a street party on 25th June 2016. Twijnstraat in 2015. Note the drainage grates in the middle of the street. They were considered dangerous for cycling. The bicycle racks on the left hand side were all removed and relocated to a side street. Short term bicycle parking in this street is all done on kick-stands or against some smaller railings. The same location in 2016 looks a lot cleaner. The large space on the right hand side is a sidewalk that doubles as parking space for cars. But when there are no cars (like in this picture) that space becomes space for walking. The side walk on the left hand side is still very narrow but without most of the street clutter it is better usable than before. Note the removal of the bicycle parking. The street lights are now fixed to the buildings. The width of the sidewalks has increased to 1.8 to 2 metres. The sidewalks have been de-cluttered as much as possible. Lamp posts were replaced by lighting fixtures attached to the buildings. Over 30 traffic signs were removed. The lower (5 cm) kerbs (curbs) make it easier to cross the streets where you like. Flush crossings were created for people with disabilities or those pushing strollers. Short term bicycle parking was clustered in squares on the pavement. Bicycle parking racks were relocated to the side street. The number of parking bays was reduced. The maximum parking time was reduced to make parking available for short time parking to visit a shop. Creating an indoor bicycle parking facility for residents. Reducing the motor traffic volume further. Possibly by changing the driving direction, introducing a smaller electric bus, introducing window times for deliveries, the cargohopper or a dynamic closing of the street. The kerbs (curbs) are intentionally kept very low. It makes crossing the street easier. The bicycles are parked in a designated space, on their kick-stands. The video shows a before and after of this street’s reconstruction. Because it is such a short street I show you the rides twice. Once with the before situation in a larger size and once with the after situation in a larger size. So you can appreciate the differences better. Video showing a ride in the street before and after the reconstruction. 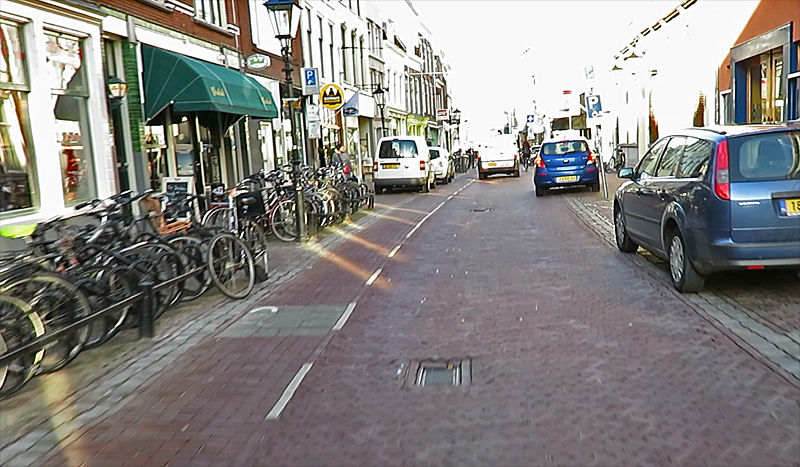 My guess is that most people here in the U.S. would think that Twijnstraat has looked like that since before the dawn of the automobile; a narrow European street lined with bricks. A few months ago I posed a question at a meeting to ex-Washington D.C. and Chicago transportation commissioner Gabe Klein. 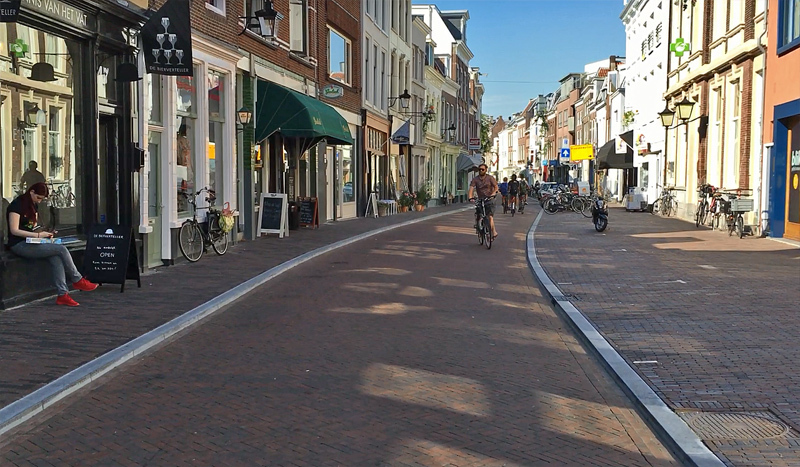 I remarked that a lot of the streets in the Netherlands are completely rebuilt every 30 years or less. 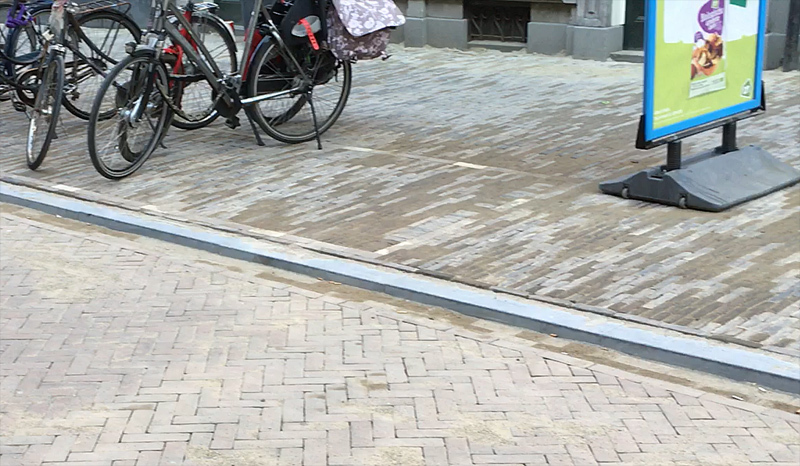 He thought that a lot of the old bricks were used again in redesigning a street there. The look of Twijnstraat is a sharp contrast to what a commercial street looks like in the city of Los Angeles with its poured concrete or asphalt for all the streets and sidewalks, along with lots of street signs. Decades of inadequate maintenance has resulted in almost a third of these streets and sidewalks being in poor condition. Measure M, a Los Angeles County transportation half-cent sales tax measure received the needed 2/3 voter approval during this months presidential election. Along with money for transit and highway construction projects, there was 2% set-aside for active transportation (pedestrians and cyclists). This sales tax will bring in over $15 million per fiscal year for active transportation out of about $765 million, or about $1.50 per each of the 10 million residents. That doesn’t sound like much, but there was no money specifically designated for active transportation in the three other existing half-cent sales taxes for transportation. In total, these four half-cent sales taxes will bring in at least $3 billion a year in revenue and it will grow as the value of sales taxable purchases increases. One of the designated uses of those active transportation funds is for first-and-last mile connections to bus stops and train stations, along with bike hubs at major transit stations. Metro doesn’t own any of the streets or sidewalks in the county and it therefore depends on the 88 cities and county to propose which sidewalks or streets that they want these funds to go towards. The first series of Metro bike hubs have been funded before this new tax measure goes into effort next July. Each of these currently built or designed bike hubs have parking for less than 100 bicycles. The first one, which opened last fall, is located east of the city of Los Angeles in El Monte. Another designated use of these funds is for the completion of a mixed use path along the San Fernando Valley portion of the LA river as shown in this Los Angeles County Bicycle Coalition video. The yellow line on the graph in the video is the Orange Line bus rapid transit which has a mixed use path that parallels it about two-thirds of the way. The red line indicates a portion of the subway. Here’s a video that briefly goes over the recent history of the LA river and talks about a proposed billion dollar upgrade of it. Ok, let’s get down to the nitty gritty: These Measures aren’t cheap! 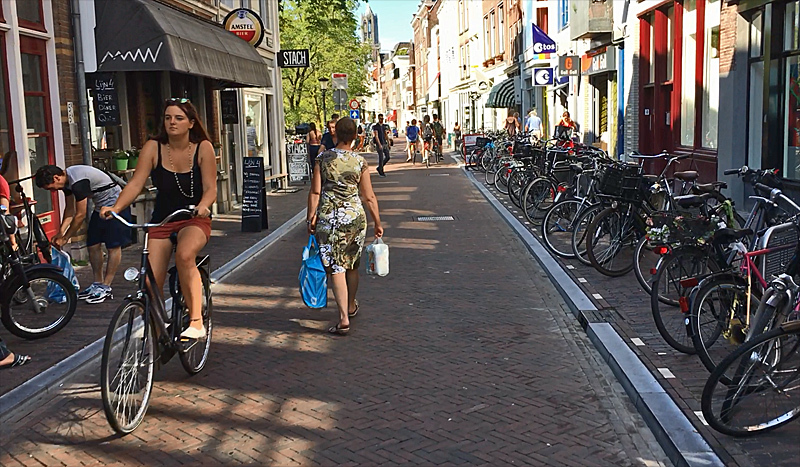 Is Utrecht such a prospering city or does it really already benefit from now maintaining cheaper cycle infra instead of expensive motorways and thus can build much more public infra? The existing roadway was decaying and needed repairs anyway (those drains and manholes have collapsed below the road level) so the local council has looked for ways to improve the area when they do the work instead of just replacing it with what was already there. A simple change to the way local government works, its more time consuming to engage the local residents/businesses and make a new plan but then the city benefits in the end. I suppose that’s a little bit too easy..
There’s enough money for Car infra in the Netherlands too, yet most Cities are redesigned continuously and expensively with Bike-Bridges, CycleHighways a.s.o. May be the People in the Netherlands have different priorities and thus are much more interested in human-scaled urban environments. Looks a lot like the kind of streets I’d like to transform the big box stores (and their huge parking lots) (the big box stores into these nice, human scale 2-4 level multi functional buildings that directly front the street that have worked for thousands of years with no need of replacement, until the car that is) into. Just about 9 metres wide usually, one way if any access for cars is allowed, cycling in both, car parking that doubles as a grassy area with permeable pavers or extended sidewalk space that maybe is used by restaurants at some times of the day by law and sign, 2 metre wide sidewalks, and lots of ordinary people of all shapes, sizes and abilities. Beautiful city you live in Mark. 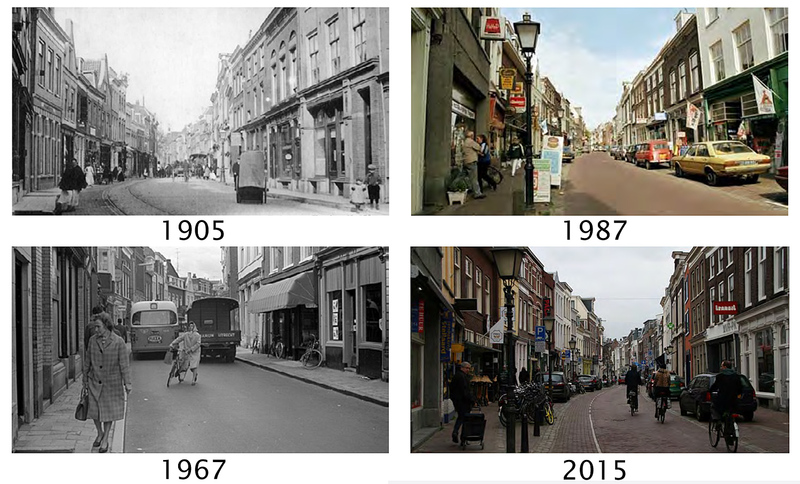 This entry was posted on 22 November 2016 by Bicycle Dutch in Original posts and tagged before and after, urban design, Utrecht.